Angus Kirkland and his research group. Progress in electron microscopy – such as better electron sources, aberration correction, and advanced detectors – is enabling scientists to investigate an ever increasing range of materials on the atomic scale. Pushing resolution limits down to the tiniest of scales not only requires advances in instruments and experimentation, but also in the methods for handling and interpreting the data gathered. Click here to explore more Lab Profiles. How long has your group been running? My group has been running in Oxford since 2003. I was in Cambridge before that at the Old Cavendish Labs and I came across with an embryonic group and have built it up from there. How many staff make up your group? Apart from myself, there is a series of staff scientists, senior postdocs and research students. Professor Pete Nellist, who joined the Department shortly after me, runs the Scanning Transmission Electron Microscope (STEM) Research Group and co-directs the David Cockayne Centre for Electron Microscopy. There are also a number of other groups within the Department that use electron microscopy as part of their research. What are the major themes of research in your group? The overarching theme in my group is looking at quantification of ultrahigh resolution imaginge data. This involves a combination of optical design, computational methods, and calculations applied to a range of materials programs. We are interested in low-dimensional materials like graphene, metal and metal oxide catalysts, and now also biological materials. Our core interest, though, is in methods and technique development. We’re not really materials scientists at all, although we undertake many collaborative projects that involve materials. What drives us is developing new methods to get improved data – or more precise information – from instruments. That involves improving experimental methods, instrumentation, computation, and theory. We sometimes describe ourselves as parasitic because we don’t really make anything! High-resolution image of a dislocation dipole in graphene. How and why did you come to work in these areas? I did my PhD in Cambridge using high-resolution electron microscopy to look at small metal particles. I carried on that work as a postdoc and gradually moved into developing methods to improve resolution and extract better data. What has been your highest impact/most influential work to date? From my personal perspective, it would be the work we did on exit wave restoration, which was a combination of experimentation and theory. We developed theoretical models that allowed us to extract what is called super-resolved data, so we could break the classic resolution limit. The other work I am most proud of has been carried out over a number of years, following on from my PhD, establishing the structure of ultrafine metal particles. We have built up a huge library of stable shapes and morphologies of metal particles – verified by theoretical models – which is very relevant for catalysis. What facilities and equipment does your group have? Our core facility is based in the Department of Materials in central Oxford, where we have a series of high-performance transmission electron microscopes (TEMs), focused ion-beam instruments for sample preparation, and a range of high-performance scanning electron microscopes (SEMs). These facilities are supported by instruments for student and postdoc training, as well as feeding samples into the high-end instruments. We also have an outpost at Begbroke Science Park, just outside Oxford, where we have a very high-performance instrument – the first of its type in the world when it was installed eight years ago. We tend to buy and commission instruments for doing specific tasks. 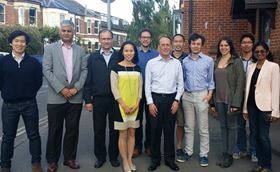 Oxford has had a long-standing collaboration with JEOL for the best part of thirty years. Sometimes the company has a new instrument or upgrade to a component that it wants to commercialize or sometimes we set up a joint research program to achieve a specific target. Most recently, I’ve become science director of a new national center for electron microscopy for physical science at the UK Synchrotron at Harwell, which is a three-way collaboration between Diamond Light Source, Oxford University, and Johnson Matthey, an industrial catalyst company. We’re currently in the process of installing two of the world’s highest performance instruments in a brand-new building, together with a new X-ray beamline. 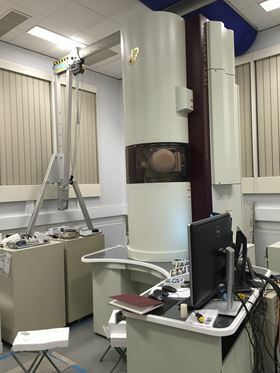 The new Oxford - JEOL Grand ARM 300CF Instrument installed at Harwell. Do you have a favorite piece of kit or equipment? Not a single one – but one of the new instruments we’re installing at Harwell is my current favorite because we’ve been building it for the last few weeks. Historically, my favorite instruments have been the ones I learned on as a student and a postdoc. Most are long gone now, but the instrument I used in my postdoc is still running at Cambridge! What is the key to running a successful group? People! You can have capital funding for instruments, but what you need are the people to maintain and develop them. There is a real shortage of highly skilled young scientists to run these machines. One of the initiatives we’re set up at Harwell, for example, is to create a different kind of academic post – a staff scientist – modeled on the structure of US national labs. These permanent posts will be for instrument experts, which has not historically been part of the classic academic model. How do you plan to develop the group in the future? My plans for the future at the moment are to establish the new center at Harwell, which we will operate as a user facility like a beamline on a synchrotron. We’ve got a lot of work to do to set an electron microscopy lab that can be run 24 hours a day, which is complete paradigm shift to how labs are usually run. I’m also involved in a large project, which I hope will be funded, involving another institute at Harwell. As part of this new center, I will lead a theme to correlate data from optical, X-ray, and electron microscopes so we can go from micron length scales right down to picometer data. This is being driven by the desire to apply physical science methods into the life sciences, supporting areas such as drug discovery. Showcasing the achievements of leading labs in materials science. Drug discovery has advanced over the last few decades leading to a plethora of advanced therapies based on peptides, proteins, and nucleic acids. Zhong Lin Wang and his team have pioneered the concept of self-powering nanotechnology devices that harvest energy from their environment. Read more about Professor Kostas Kostarelos.